After the Ottoman Rule, the region around Pilisvörösvár was completely depopulated. Lord László Csáky initiated a repopulation with German farmers. Thus, four families from southern Germany settled in the area in 1689 and started what was to become a flourishing agriculture. They came to the empty Padmaniczky manor in Kyszntho (Kisszátó) and Kyralyzanthonya (Királyszántója). The development of the region was furthered by its easy access. At the end of the 19th century, coal mining was started. 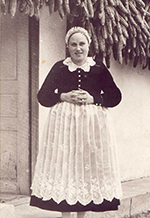 Thevillage museum exhibits local historical objects, furniture, folklore costumes and old paintings. Miners’ memorial park at Rákóczi Street: Around 1908, the so called “New Colony” was built to house the local miners of Pilisvörösvár. All houses were built alike: four two-room apartements with yard and garden. The colony had a tennis court, a casino with a library, quarters for journeymen and from 1930 onwards its own chapel. At the centre of the former colony a park with a memorial was built which commemorate the legendary miners’ strike of 1928/29. In 2008, a “Miners’ Commemorative Parlour” was established. 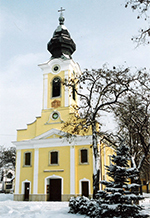 Catholic Church (built 1703) Its main monument is the altar made of white and red marble. It used to be in the castle Roman chapel of Buda Castle and was restored and brought to Pilisvörösvár after the chapel’s destruction in World War II. Close to the church, the statue of blessed Gisela, wife of Saint Stefan, the first king of Hungary, can be found. The bronze statue was created by Tóth Dávid as a reminder of the Danube Swabian’s – who were settled in the region over 300 years ago – roots in the region. The forest chapel was built in 1851 in honour of the “fourteen helping saint and the Mater Dolorosa”. Its Rococo-style woodcarvings originate from the same time. The forest chapel possesses a relict: a small part of the True Cross. 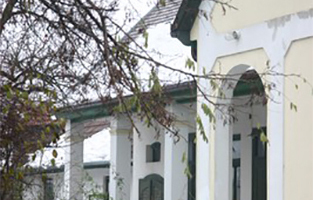 Lahmkruam” is a memorial park of local history at Petőfi Sándor Street. A small lake occurred in the clay pit’s dent, which is called “Lahmkruam” – a local expression for clay pit. The lake was filled up in the 1970s. In 2009, the local administration established a memorial park with eleven bilingual plates about local history. RIGHT: The church’s main altar used to stand in Buda castle’s chapel, which was destroyed in World War II. 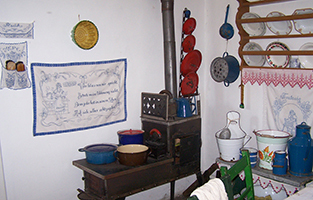 The village museum shows farmers’ everyday life of old. 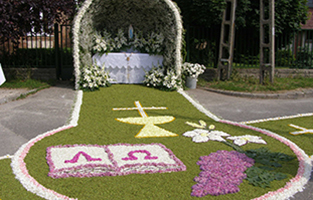 Up until today, carpets of flowers are created for the Corpus Christi procession.